The resolution is 1280×800 (since it’s widescreen), not 1280×1024. Also, on 32bit Vista, it’s only using 3GB of ram. The Vista screenshot says 4GB because as of Service Pack 1, it adds physical (hard drive) memory to the ram in order to appear to be using all 4GB of ram, a pretty shady trick on Microsoft’s part. Yor’re right, Corwin, thanks for the correction regarding the screen resolution. Regarding the RAM, you’re not. SP1 for Windows Vista x86 comes with a small design change. Before that 32-bit Windows didn’t report the correct RAM size if above 3 GB. Say, you inserted 4 Gig, but System properties reported 3. That has changed. System properties do report 4 Gig if 4 are installed. Nevertheless normally 32-bit Windows cannot use more of 3 GB RAM. See details here: http://support.microsoft.com/kb/946003. Note that some tools still report 3 GB (e.g. winver) while msinfo32 gives you a clearer picture. where can i get the tx 2500 with 2.3 ghz CPU?? The only CPU listed there is the AMD Turion X2 Ultra Dual-Core Mobile Prozessor ZM-82 with 2.2 GHz. 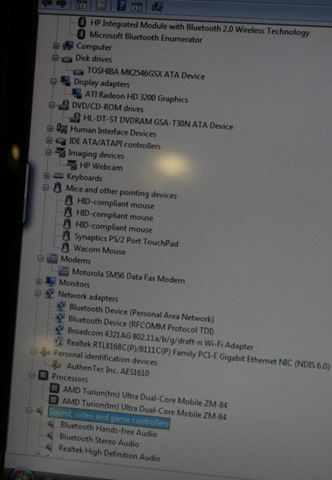 What you see on the photo above with the ZM-84 is a shot from the device manager of the prototype HP showed during the press event in Berlin in June. But AMD currently lists only three available X2 Ultra CPUs, ZM-80 (2.1 GHz), ZM-82 (2.2 GHz) and ZM-86 (2.4 GHz). Seems that there won’t be a 2.3 GHz Turion Ultra. See http://tinyurl.com/5kzs5q (AMD page). The only German shop with the TX 2500 is Cyberport (www.cyberport.de), also, only with the ZM-82. Seems you’ll have no choice, sorry. is there possiblity to downgrade Vista to XP on tx 2500? In my opinion it doesn’t work good on Vista. I am dreaming about xp on it… Please help. Yes, it is possible to install XP Tablet Edition. As this Tablet is considered a consumer device HP is not allowed licensewise by Microsoft to offer a downgrade CD/DVD. You have to get your own Tablet bits and license. 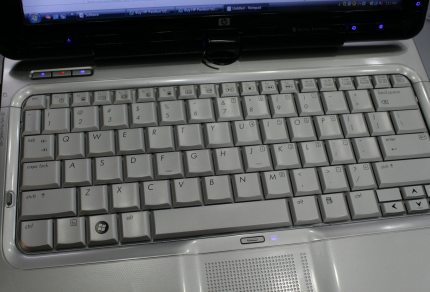 Also, I cannot find a lot of HP software for XP for the Tx2500. Goto HP and download XP drivers into a folder for later installation. For default hardware like Intel WLAN etc. you’ll find drivers on Windows Update. My recommendation: Backup all your data and settings to an external hard drive/another PC and try Windows 7 when it is out as a public beta (next week internal Beta, but perhaps also public). Would be nice if you report your experiences here. I have a tx2500 with 32-bit Vista originally installed, but I run it mainly with Suse 11.2. To get audio, in YaST’s Sound settings, I had to set the Azalia device as „toshiba“, without the quotes. For wifi, I had to install the Broadcom 43xx drivers (pretty easy), so I used Ethernet until I got that working. Otherwise, everything works including webcam and finger sensor. I also got a TI-chip based PCIexpress card for firewire support. The only thing I’m still tweaking is the touchscreen settings using Sax2, but the pen and eraser work great. In fairness to Ubuntu 9.4, it ran too, but it not as easily configured and the touchscreen was real rocket science to implement and keep running; which was not the case with Suse 11.2. Both Ubuntu and Suse are twice as fast as Vista on the tx2500 and both let you keep your Vista partitions and install Linux in a separate partition with Grub as boot manager, allowing you to pick Vista or Linux on boot. From linux, I can browse and edit my Vista files, but vista is not so smart to get to the Linux side. So I only Vista if I absolutely have to now. This is a great notebook touchscreen for its size/weight/features. Very portable yet much more powerful than any of the wimpy netbooks out there and in a slightly more „man-sized“ package — not quite „so“ small as a netbook. For 5x the price, it should be more Ferrari than Fiat though. Running Suse 11.2, this is a hyper-Ferrari now.